THE GUARDIAN'S DIARY is available on Amazon and Barnes & Noble as well as other online booksellers. Seventeen-year-old Jedidiah was born with a gruesome deformity that causes him to drag his foot. He searches for acceptance through drugs and skateboarding. He sets his sights on becoming a champion skateboarder, but amputation, a mission trip and two girls challenge his dream. As he recovers from surgery, Jedidiah opens his heart to both girls. Can he rescue the one who needs him without losing the one he needs? And, faced with a second amputation, can he open his spirit to supernatural help? 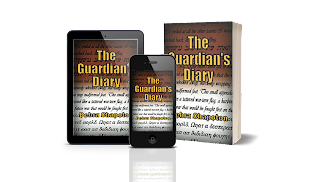 THE GUARDIAN’S DIARY taps on the door of the paranormal while addressing adolescent issues and pushing against the world’s view of right and wrong. This is Young Adult Christian Fiction. Get your copy of THE GUARDIAN'S DIARY on Amazon or Barnes & Noble or other online booksellers.